We have a large collection of 100 different types of Bhindi recipes. Yes, it's clearly evident that Ladies Finger and the different types of Ladies Finger recipes are super popular all across our lovely country. Ladies finger also known as okra, commonly called as bhindi is a much-loved vegetable by children. They are readily available throughout the year at affordable prices. Although it appears to be a bit sticky while cutting and during cooking also, bhindi becomes okay after cooking if prepared the right way. To avoid sticking of bhindi to the knife, apply some lemon juice on the knife blade before cutting ladyfinger. Green in colour and long, with an attractive ridged skin, bhindi can be cut into round pieces or sliced into 4 halves or maybe put the whole in a mix vegetable subji. Sautéed or fried or added to dishes like raitas and kadhis, you can make a lot of dishes using bhindi, ranging from starters and pickles to subzis, both simple and elaborate. If you are looking for recipes on how to cook lady finger in a unique manner? Then to your endless list of pakora variants, add this Bhindi Pakora which is going to be your new favorite. With zero addition of water, an assortment of dry spices and a dash of rice flour to provide the crunchiness, these unique pakoras taste amazing with a cup of chai while its pouring outside. Also, you can make drool-worthy appetizer like the Crispy Okra tossed with oriental ingredients. If you think stir-fries are limited to exotic vegetables and sauces then you are sooooo wrong. These Indian versions of Stir Fried Bhindi with Peanuts and Kerala style Bhindi Onion Stir-fry made using a handful of ingredients from our kitchen shelves are lip-smacking and can be made very quickly! Lady finger recipe South India you will find some knowledgeable people adding a handful of chopped bhindi to their dosa batter to get a charming golden colour and exciting crispness. Bhindi can be cooked as a subji, a part of the main course and eaten with phulkas or rotis. Stuffed Bhindi Sambhariya, Sukhi Bhindi, Bhindi Masala, Achaari Dahi Bhindi are some popular ladies finger recipes. You can even use okra to enhance the flavor of dals and kadhi. Bhindi Ni Kadhi and Bhatia Kadhi are some authentic Gujarati recipes made with interesting combination of ingredients. Apart from all the popular sambhar vegetables like the drumstick, pumpkin, shallots and tomatoes, the Kerala Sambhar also makes use of lady finger. Have a go at our favourite Lady Finger dishes, ranging from Stuffed Bhindi with Paneer to Sukhi Bhindi. Tease your taste buds with flavourful treats like the Bhindi Mappas and Lahsuni Bhindi, or soothe yourself after a tired day, with a homely dish like. If you crave for more of bhindi, head to our website and you will find many more ways of How to make Lady Finger. 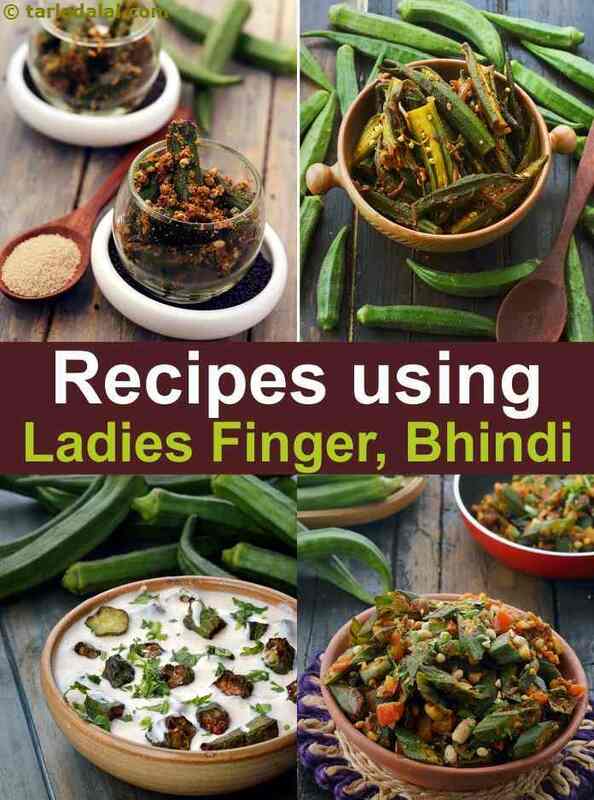 Enjoy our collection of indian ladies finger recipes, bhindi recipes below. Crunchy, crispy and tasty, it makes an ideal cocktail snack. The distinct taste of Kerala comes alive in this subtly spiced subzi. The onions and coconut give this gravy a mild crunchy texture and whole red chillies make it a spicy delicacy. Feel free to adjust the amount of chillies to your liking.